Now summer has well and truly ended, I find myself preparing for the cold, dark embrace of autumn. These days I’m grabbing my coat before I leave the house more often and contemplating when is a sensible date to fully give in and turn the heating on. Winter is coming, as a popular book and even more popular TV series reminds me, and right now those memories of record-breaking summer temperatures and sweating from places I didn’t know I could, seem like a distant memory. What I need is a pick-me-up, something bright, colourful and cheery to remind of those sunny days, to be the tonic to the dark and dingy weather as the nights draw ever closer. 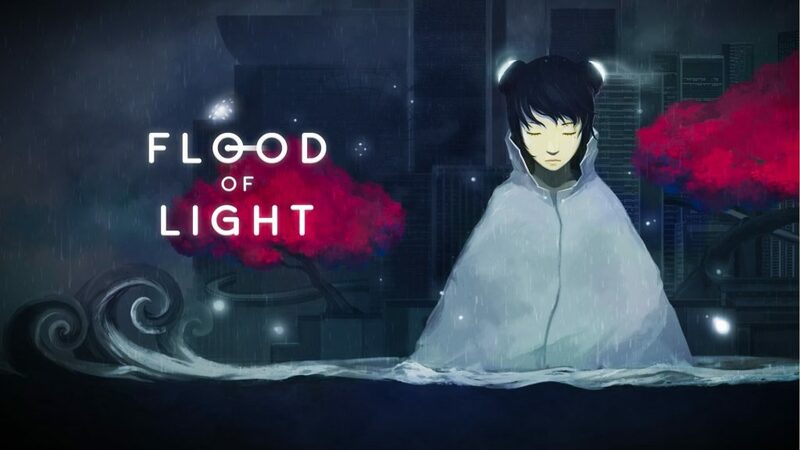 So Flood of Light then, a 2D puzzler set in a deserted world, where it’s permanently dark and constantly raining, is perhaps not what the doctor ordered. But its gloomy aesthetic serves a couple of key purposes. For one, the main premise of the story is that your role as the mysterious Guide, a female protagonist who wears a raincoat (suitable attire as you’ll come to see) must save the city by lowering the water level that has built up from the incessant rainfall. 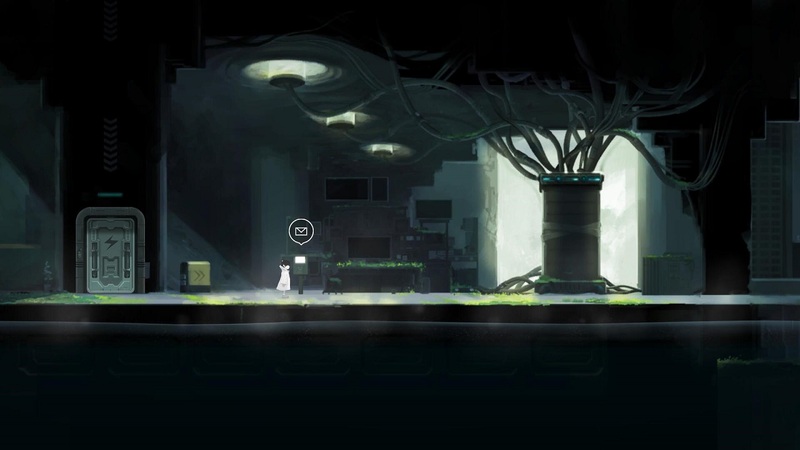 And the other is that the main mechanic you’ll use to do this is through manipulating light to solve puzzles, which contrasts perfectly with the drab, monochrome setting. Your character starts at the roof of a building, and as she successfully lowers the water level, descends further down the floors, until she can lower it completely at the ground floor and remove the watery blight from the city once and for all. 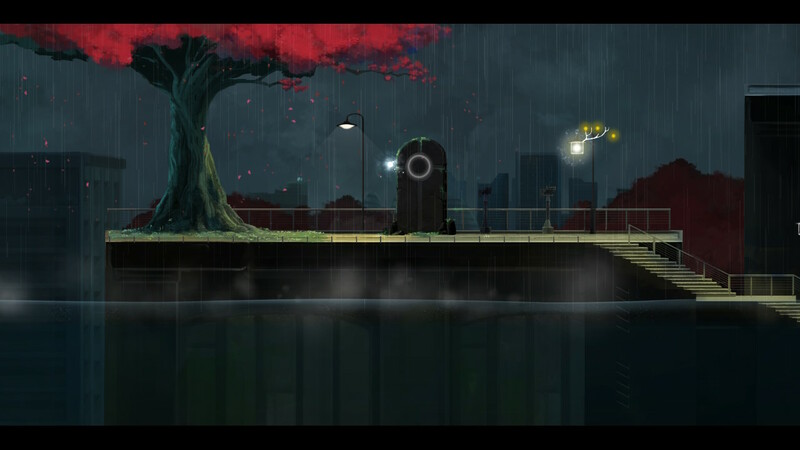 The design of the puzzles is centred around your character’s ability to absorb light from various lamp posts, and then direct that light to other sources to progress or lower the water. The trick comes because the light can only travel a certain distance, so you’ll need to be close enough to your target to get involved. It is also possible to move light sources from post to post if they’re close enough, and if there is enough light to share between them. It sounds more complicated than it plays out in reality, as the game does a good job of showing you the ropes of absorbing and transferring energy. New mechanics are also introduced at a sensible pace, whether that be lifts and switches that are controlled by the light, moving platforms, or even different coloured lights with different properties to consider. It never feels overwhelming and the learning curve of any new additions always feels straightforward and manageable. That’s not to say that Flood of Light is easy. Sure it starts off fairly simple, with some rudimentary puzzle-solving, but it soon ramps up the difficulty as more different elements are introduced and the on-screen challenges become more complex and thought-provoking as a result. There were times when I was completely stumped about how to solve a certain puzzle, seemingly not having enough light to progress, but through trial and error and perseverance I could figure out what I was supposed to do. And as is usually the case when overcoming particularly tough brain-teasers, that glowing sense of pride welled up inside of me, making my victory all the sweeter. There are however, a few odd design choices which make the overall experience less fun that it should be. Firstly your character moves around at an absolute snail’s pace, which as you’re pondering your next move is no big deal, and in fact the calm emotionless movement is in keeping with the overall feel. However if you’ve messed up a section and need to start again, backtracking over old ground can be painfully slow, to the point where resentment can kick in. Sometimes on a restart I found myself having to take a break for a few minutes before jumping back in again, just so I was in the right frame of mind. To compound this issue their are arbitrary save points and a restart takes you to the last such checkpoint. Normally such a feature would be a blessing, but because in order to complete the puzzle at hand you may need to go back to before the checkpoint (to have enough light for example), those save locations can become redundant on occasion, and more frustrating than helpful half the time. Another double-edged sword is Flood of Light’s collectibles, known as Wicks. Essentially these are optional posts to light (and keep lit, using up your precious resource) and there are a few in each floor of the building to find. Now I know such things are completely optional, but given you get a ranking at the end of each floor telling you how good a job you did, and one of the measures is the amount of Wicks you lit, it’s hard not to really want to light them all. However because of the design of the puzzles, you often need to transfer light in a certain order meaning you can miss your window to light Wicks successfully, and sometimes you don’t realise until the end of a level that you’ve missed your opportunity and more slow backtracking ensues. This is made even worse when sometimes you need to carry light over from previous areas to have enough to light Wicks. If you don’t realise this first time, it can mean a long process of retracing your steps if you want to get a decent rank at the end of the level and feel like you’re playing the way the developers intended. But it’s not all bad. The calm and serene soundtrack that plays in the background provides a soothing backdrop to the whole experience. Beautifully soft piano accompaniments perfectly supplement the relaxed gameplay on offer. Gentle notes are played in tandem with an equally gentle and pleasant rumble of the Switch Joy-Con when you transfer light around the world and it serves to create a very tranquil, but ultimately satisfying experience. And this is likely to be the biggest draw of this title for most. For those wanting to immerse themselves into something that will test their grey matter but offer it up in a way that promotes a sense of calm, Flood of Light will be right up your street. For others though, the laid-back approach will feel too sluggish and hampers a title that whilst it has some interesting ideas and is packaged up very nicely, it falls short of being a truly memorable experience once it’s over.